The No Logo frame bag has been on my singlespeed bike for several weeks and it is working great. 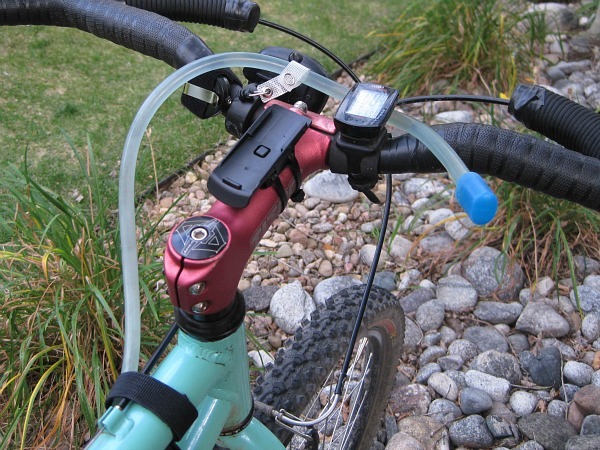 But there was the lingering issue of how to route the hydration tube coming out of the frame bag be to make it easier to grab and take a drink. That problem now has a solution. RuSH mentioned in the comments on the frame bag post that an ID badge retractor would do the trick. And by golly, he was right. Sometimes, using a non-cycling or non-camping item can solve your problem. This is definitely one of those cases. The badge retractor provides enough pull to keep the hydration tube in place and it’s easy enough to extend when taking a drink. 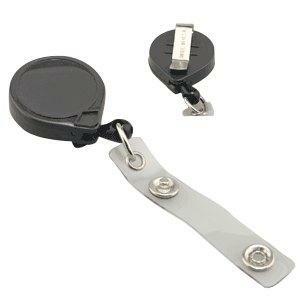 Badge retractors can be found in hardware stores or office supply stores for about $2. The stem is probably the best location for mounting the retractor, but as you can see below, the stem on my singlespeed is already taken up with a GPS mount. Instead, the retractor was placed on the handlebar and held in place with a velcro strap. The silver clip on the retractor makes it easy to use a velcro strap or even zip tie to attach the retractor. Even though the retractor has a flat bottom, it doesn’t move around on the handlebar. Hydration tube coming out of the frame bag and held in place with the badge retractor. Tube extended for drinking. After drinking, the retractor pulls the tube back in place making it easier to let go of the tube. 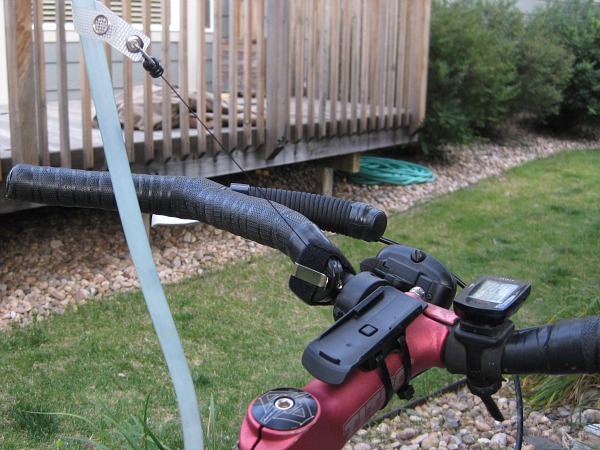 Another option for mounting would be to run the hydration tube along the bike’s top tube towards the seat post and attach the retractor close to the seat post. The velcro straps on the frame bag would give plenty of places where the retractor could be mounted. So far, this setup has worked well, but it has only been out on a few rides. If the retractor does start to slip around, some foam pieces applied to the back of the retractor should help it contour to the handlebars better and stay in place. Thanks again to RuSH for the idea of using the badge retractor for cycling. See, there is something useful that comes out of corporate cubicle farms.